All-time classic kids movies are always great on video. You'll want to watch it dozens of times, so you might as well just buy it. If you want just the movie(s), I recommend the inexpesive but extras-lacking 3-pack that includes 'Toy Story' 1 & 2, plus "A Bug's Life." If you want all the DVD bells & whistles (commentary, making-of & tons more), you want the 'Toy Box' collector's edition 3-disc set. But advancements in animation have almost become old hat. Sure it's cool, I hear you nodding, but what happens to Woody, Buzz and the gang? "Toy Story 2" is a both a genuinely emotional parable about outgrowing childhood and a screwball rescue mission that kicks into gear after Woody (voice of Tom Hanks) is stolen by a greedy toy collector while trying to save another of Andy's toys from a garage sale. Naturally, the cocksure space hero Buzz Lightyear (Tim Allen) organizes a search and rescue to retrieve his good buddy and soon Mr. Potato Head (Don Rickles), Slinky Dog (Jim Varney), Rex (Wallace Shawn) the insecure toy tyrannosaurus, and Hamm (John Ratzenberger) the piggy bank with a notoriously loose cork, set out across town in search of their leader. Part of the delight of this sequel its bottomless well of inventive wit. Along the way to rescue Woody, Lasseter leads this crew through wildly creative adventures. They cross a major thoroughfare hiding inside traffic cones (and causing traffic chaos). They recruit help inside a giant toy store, where they are momentarily distracted by a gaggle of partying Barbies and have a run-in with Buzz's nemesis, the nefarious galactic Emperor Zurg (voiced by Andrew Stanton, one of two co-directors on the film). The script, which Lasseter supervised with half a dozen writers contributing, is sharp and quick, jam-packed with perceptive plaything humor ("I'm packing your angry eyes, just in case," says Mrs. Potato Head) and hilarious homages to old westerns, "Star Wars," early Pixar shorts and an especially side-splitting "Jurassic Park" spoof. As the gang forges ahead on their crusade, Woody is busy discovering he's a major collectors' item who once had his own kiddie show (think "Howdy Doody"). At the collector's apartment, he meets his TV companions: Bullseye, his trusty, cuddly steed; Stinky Pete the Prospector (Kelsey Grammar), who is proud to lumber around unsoiled and still in his original packaging; and Jessie (the perfectly-cast Joan Cusack), a yodelin', knee-slappin', yeeee-haw-in' cowgirl doll who tries to talk Woody into staying so she won't have to go back into storage in a dark, lonely cardboard box. Through an honestly heartbreaking flashback, Jessie warns Woody that he will someday be discarded, just as she was when her owner grew up, and she almost convinces him that the cushy, pampered life of a museum piece is better than being part of a child's life. These characters are so vivid that even after the credits roll it's a struggle to remember they're only animated. Even their famous-name voices have become so congruent with these wonderful toys that you forget you're hearing half a dozen of the most recognizable stars in show biz. But it is animation, after all, and the climax of "Toy Story 2" is one of the most ambitious animated sequences in the short history of computer cartoons -- a needle-in-a-haystack search through an airport's intricate baggage system as the toys try to find Woody before the collector ships him off to a Japanese toy show. 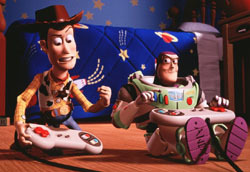 "Toy Story 2" may just be the most astute, funniest, most artful, most supremely satisfying animated sequel ever. One thing is for sure -- it's certainly the most fun.